YANGON, Myanmar (CNN) -- Myanmar opposition leader Aung San Suu Kyi and an American man who swam to her lakeside home went on trial in the military dictatorship Monday behind closed doors inside a prison compound. 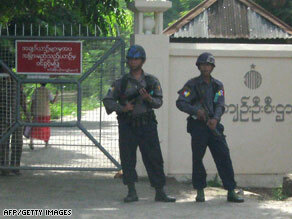 Soldiers guard the entrance to Insein Prison on Monday in Yangon, Myanmar. The trial is expected to last about three months, said Nyan Win, spokesman for her National League for Democracy party. Suu Kyi's lawyer asked the court to open up the hearings but was turned down because of security concerns, Win said. Police put up roadblocks on the streets leading to the Insean Prison near Yangon, with a half-dozen officers at each station. Shops around the prison were closed, according to opposition exile groups. A group of diplomats from Germany, Italy, Australia and Britain tried to pass through the barricades to attend the trial. They were stopped and turned away. "It was a way of signaling our concern at what's happening and the need for the proceedings in the court to take place in an open and transparent fashion," Britain's ambassador to Myanmar, Mark Canning, told CNN. About 100 supporters of Suu Kyi waited outside. He is accused of staying overnight in Suu Kyi's lakeside home earlier this month, violating the conditions of her house arrest, according to the country's ruling military junta, which rarely grants her visitors. The central Missouri man was appointed a lawyer selected by the U.S. embassy, Win said. Suu Kyi, the 1991 Nobel Peace Prize laureate, and two of her maids have been detained under Section 22 of the country's legal code -- a law against subversion -- according to Nyan Win, spokesman for Suu Kyi's National League for Democracy. Suu Kyi, 63, had been scheduled to be released from house arrest later this month after being incarcerated 13 of the past 19 years. She is now being held in a specially built area of Insein Prison, where Yettaw also is detained, a U.S. Embassy official told CNN on Friday. "This is the cunning plan of the regime to put Daw Aung San Suu Kyi in continuous detention beyond the six years allowed by the law they used to justify the detention of her," said the U.S. Campaign for Burma, a pro-democracy group fighting for her release. "Daw" is an honorific. The southeast Asian country was known as Burma before the military government changed it to Myanmar. Those who oppose the junta still use the old name. Suu Kyi's lawyer, U Kyi Win, blamed her prison detention on Yettaw. Local media said Yettaw, a 53-year-old former military serviceman from Falcon, Missouri, swam almost two miles across Inya Lake on May 3 and sneaked into Suu Kyi's home. Police maintain a round-the-clock presence outside the house. And swimming in the lake is forbidden. U Kyi Win told CNN that Yettaw arrived at his client's house that day and that she asked him to leave immediately. U Kyi Win said Yettaw refused to leave, first saying he didn't want to swim in daylight for fear of being captured, and later blaming leg cramps. Yettaw finally left May 5. Suu Kyi didn't tell authorities about the visit because she didn't want Yettaw or anyone else to get in trouble, Win said, nothing that several of her party members and supporters are already in jail. He added that Yettaw would likely be in the courtroom during the trial. Little else is known about Yettaw's role in the Myanmar incident or his intentions, apart from local media reports that said Yettaw, a diabetic, told Suu Kyi's two housekeepers he was tired and hungry after the swim and they offered him food. Some previous media reports referred to him as John William Yeattaw. He appeared healthy and in good spirits at a hearing on Friday at Insein Prison, the U.S. Embassy official said. The defense will argue that Yettaw entered Suu Kyi's home due to poor government security, said Jared Genser, a Washington, D.C.-based lawyer who is one of the attorneys on her defense team. "Frankly, she does not believe she did any offense," Genser said. He noted that Insein Prison houses many political prisoners, and the conditions are poor for even a young, healthy person. Tuberculosis is rampant, mosquitoes and other insects are numerous, and nighttime temperatures at the prison frequently reach 90 degrees Fahrenheit (29-32 Celsius) with no fresh air traveling through the facility, Genser said. "There is deep reason to be concerned with her detention," he said. "Insein is a notorious prison. It is filthy. ... When you combine that with her health concerns, it is very worrying." Suu Kyi has been the face of Myanmar's pro-democracy movement and the focus of a global campaign to free her. Her National League for Democracy party won over 80 percent of the legislative seats in 1990, but she was disqualified from serving because of her house arrest, and the military junta ignored the results. It was during her house arrest that she won the Nobel Peace Prize in 1991.